The Grills Preserve & Wildlife Sanctuary is a remarkable tract of land that offers a wide variety of terrain, from uplands on the Westerly Land Trust portion, to a mixed hardwood and wetlands environment on the Hopkinton Land Trust portion. To complete the 6+ miles of trails, a raised boardwalk above the flood plain of Tomaquag Brook needs to be engineered and installed, as well as a significant elevated bridge spanning Tomaquag Brook. All the engineering is complete, all the permits are in order, and now it is time to make it happen. A previous page, “Grills Preserve Trail Widening” showed slides of the work to allow the trucks access to the construction zones. This page will end up having multiple slide shows illustration the progress from the end of September through October and beyond. The first slide show documents the end of the construction on 9/30/13, capped off by the lugging and placement of two temporary foot bridges across the divided stream bed of Tomaquag Brook. As the crew lugged their tools and the photographer back to the trucks, a hiking couple from Stonington, CT, came by, enjoying the wonderful Fall weather and the ambiance of the Grills Preserve. They are the first of what we hope will be many hundreds of recreational hikers to cross Tomaquag Brook on the (temporary) bridges of “Tomaquag Trail”! Peter attaches the hydraulic drive to the shaft of the pile auger. He actively steers the auger’s angle into the earth. Erin controls the rotational speed and pressure to the drive. Mike is hoping that those giant worm thingys don’t come out. For the bridge pilings, which have 3 augers on each shaft, Erin sinks them till they hit 10,000 pounds pressure on the auger. They are deep and firmly attached anchors for the ends of the two elevated, fiberglass truss bridges that will span Tomaquag Brook. Peter and Erin have installed over 800 helical auger pilings at various trails all over New England. You can see in the pictures of them at work, at times there is craftsmanship & attention to detail, and at other times it is hard “Country Style Rasslin”. Peter is a very tall man, and he needs his leverage to position the auger and hydraulic drive head in the correct location and orientation. Oh, by the way, even in the flood plain, they encounter New England’s abundant stones. Having heard it a few times, it is a nasty noise! Erin has responsibility over the adjustable Torque Bar, seen extending down at an angle from the drive head. She will position this, then drive a steel bar in the ground on the proper side to control the massive amount of torque the drive head generates. As was mentioned earlier, she operates the machine using up to 10,000 pounds of hydraulic pressure spinning the helical augers. That is a LOT of torque that she tames with her simple, but effective equipment. She also controls the flow of the hydraulic fluid with a foot valve. The flow regulates the rotational speed of the drive head. She has control of the direction the drive head turns. And she has to keep a sharp eye on her pressure gauges, as well as the speed the gas powered hydraulic pump operates. When you see these two skillfully going about their business, after a while the concentration they both devote to doing their job safely becomes apparent. They are Artisans of the Trail, not Cowboys. The day’s work begins by cutting the pipes to the proper height. Erin uses a portable gas generator’s electricity to power a grinding disk. The first thing you will see is the shower of sparks in the daytime. Erin is a nice lady to talk to, but she is NOT timid. Only later will you notice the green bucket full of water, in the event a spark kindles a flame. Five gallons of water in the first minute is a sure cure. Peter has his own generator, and an electric band saw. Peter, Erin and Ed drill the last piles. The work progresses, and Ted, Harvey and Rick start moving the 8” X 8” Black Locust Timbers into place, while Marilyn comes prepared for any warblers that might be curious about the progress. This is the last day for Peter & Erin. They will be back in a few weeks to install the two fiberglass bridges over Tomaquag Brook. The Tomaquag Trail is already drawing visitors! And they are bringing their humans with them! Walking the trail, on two or four feet, is what the Land Trust is all about! The construction of the twin bridges and the elevated flood plain board walk will complete the link up between the Hopkinton Land Trust and the Westerly Land Trust. These three slide shows chronicle unloading the truck, the first beams set in place prior to installation, some more brush clean up, and the “Long Lugs” as the heavy beams are toted to the far end of the flood plain bank. It was another crisp, frosty morning, a beautiful Saturday for working on the Tomaquag Trail. You have been looking at a ton of pictures on this page, and I hope the photography catches the concentration of the many volunteers as they perform a wide variety of tasks to make this trail the Show Piece of the Hopkinton & Westerly Land Trusts. Another subtle thing that you might have sensed is the mix of people doing this work doesn’t match up to the American Stereotype of “Outdoorsy Youth”. When you view any of the slide shows, you will see a mix of Older & Younger, with Women & Men, all working to their capacity, and by the end of the slide show, everyone has Tomaquag Valley dirt on their hands! And every one of them is a volunteer, building something for our Community’s Future. Maybe that’s something you would like to do also. If They can, You can too! If so, contact me, Tom Helmer, at tbhelmer@cox.net and I will connect you to the right folks. The weather continued good during the construction. This day saw the fiberglass girders accurately located on the Black Locust cross ties mounted on the helical pilings. When the Sunday crew called it a day, you could see in your mind’s eye the finished trail cutting across the wet flood plain next April, but the hardy hikers would be high and dry, clomping across the sturdy boardwalk. The pictures for this slide show were taken by Harvey Buford. The weather continued good, with the rain thoughtfully occurring over night! Today saw the cutting, chamfering, pre-drilling and installation of the Black Locust decking of the board walk. All was proceeding smoothly at the start, until it came time to start up the gasoline generator. In succession various tricks were tried, switches and levers were flipped, Japanese was interpreted in various permutations, but Mr. Generator was obstinate to all our gentle pleadings and horrible threats. The wheels were turning as to how to salvage the rest of the day, when the tiny switch, carefully hiding in the secret recess was discovered! Now everyone was back at it, and Peter and Crew appeared to begin the 55’ Bridge assembly. Scaffolding was assembled in the middle of Tomaquag Brook, while up and down one hundred and fifty feet of Tomaquag Trail, many hands were at work on at least five distinct operations. It was a wonderful sight, and I urge you to look for that picture, press the double bar Pause button, and look at what is happening in the woods. Word must have reached the Main Stream Media, because the next thing that happened was a Fly-By from the Met Life Blimp! Check out the Photo! The weather continued good yet again. Today saw the continued installation of the Black Locust decking of the board walk. Ellen was placed in charge of directing the accurate assembly of the bridge components, with the goal of completing the farthest Bridge structure prior to lunch. The 169 photos in these seven slide shows document the progress and successful assembly of the first portion of the Bridge! As you view these pictures, many of the friends are handling either cold steel or cold fiberglass, and their “chills” are apparent. And when they start to lug the trusses, the weight becomes apparent. But at the end, look for the concerned faces to turn to elation as the first 12 ½ foot section stands upright! The final two slide shows record the long 30 foot span and the other 12 ½ foot span. Those pictures were taken by Harvey Buford as the day of accomplishment closed. The weather shifted to cloudy, unlike perfection, but it was still relatively warm for the end of October. The progress on the Bridge & Trail is apparent in the later Photos. This was the last day for Peter, Ellen & Erin, three very hard working Professionals! We Thank You for loaning us your skill and expertise! Best Wishes from us all! The weather remained cloudy, but we all raised a sweat as various tasks were completed. Just a few more days next week in November should bring an end to the bulk of the work, although Gary Marsh is making a nice sign for the parking lot, which will require installation. As you look around the photos, notice that so much of the construction material is gone! It’s now in the Bridge and the Boardwalk! More hikers and mountain bikers are using the trail now, and this slide show features 6 people and 3 dogs fulfilling the purpose of the trail. It also shows the last details getting completed, although a complex trail like this beauty is never really “Done”. I am told that nearly 30 people participated in the final push to get the Boardwalk and Bridge in and functioning before the Winter, and I expect that somewhere along the way, I shot the picture of nearly everyone. I still have to get Gary Marsh and his Trail Head Sign, but he will end up on this page sooner or later. 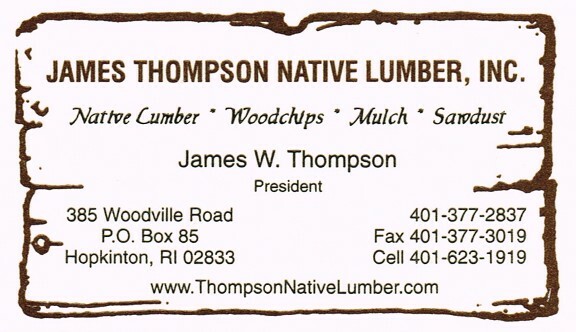 The gratifying Community response to the Hopkinton Historical Association’s recent request for donations to save General Thurston’s Grave produced the required funds to allow Rocky Harkness, of Rocky’s Tree Service, teaming up with Jim Thompson, of James Thompson Native Lumber, to progress to the actual removal of the huge rotted tree. Mr. Harkness graciously lowered his estimate once he learned of the civic nature of what HHA was asking of him. 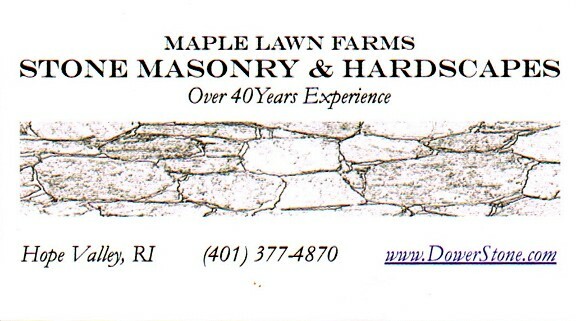 A third local business, Maple Lawn Farms, will follow up later with restoration of the stonework. Speaking for our Community, we appreciate the generosity show by these three local, long time, family owned businesses, and thank them for their support of Hopkinton. In return, we have reproduced the business cards of all three after the time lapse slide show. You can judge the skill of Rocky’s Tree Service via the 155 photos that make up the time lapse recording, but the quality of all 3 is demonstrated by the simple fact that each has weathered the hard economy. If they didn’t deliver a quality product or service, that would not be the case. Friday, October 4th brought unsettled weather, but no wind. You will note the bands of sunshine and dense clouds as they affected the photographs. The photos condense 5½ hours into 5+ minutes. Enjoy! 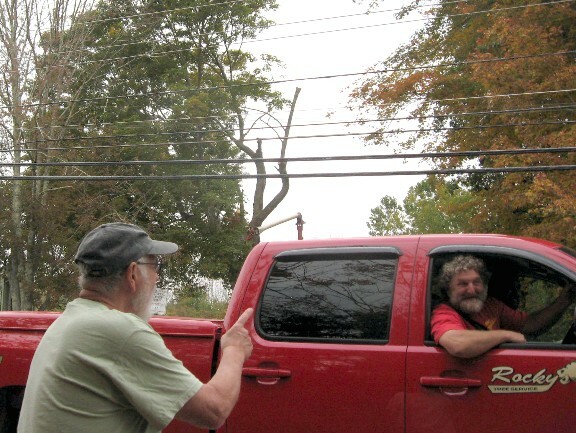 Rick Prescott and Rocky Harkness confer about progress as the tree comes down in the background. HHA was very pleased! 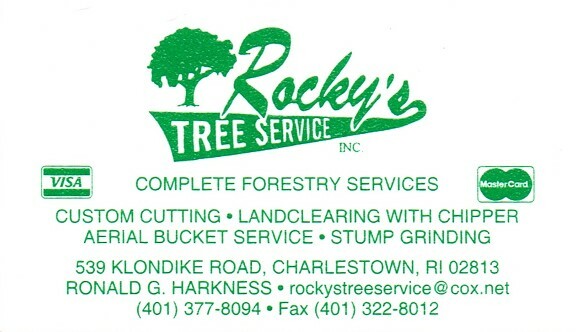 Rocky’s Tree Service has the equipment and the skilled arborists to make a difficult job in a delicate situation come to a successful conclusion in one day. They got it done! Below are enlarged business cards of the three Hopkinton family owned companies which are working with the Hopkinton Historical Association to preserve the General Thurston Cemetery. But without YOUR GENEROSITY in donating to the project, nothing could be done. You all got it done!